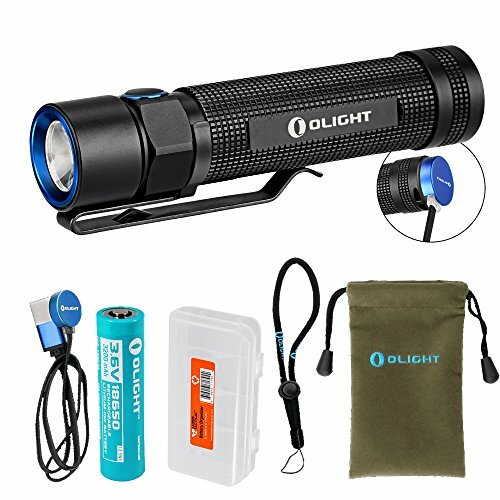 The Olight S2R is brighter and better than ever! A brighter, rechargeable upgrade to the Olight 950 lumen S2 and S2A, this light packs a powerful burst of 1020 lumens from a CREE XM-L2 LED. The included Customized 3200mAh 18650 Olight battery and magnetic charging cable enable this light to meet all your illumination needs. The lightweight design and convenient carrying options such as the clip, lanyard or pouch make this flashlight fantastic for everyday carry while the magnetized tailcap offers an added level of convenience and usability. With so many features and functions, you're sure to love this light! * Quick access to turbo mode: Simply double click the side switch to enter. COMPLETE PACKAGE - Comes with a convenient charger, Customized Olight 3200mAh 18650 battery, lanyard, pouch and bonus LumenTac battery organizer capable of holding 2x 18650s or 4x CR123As for easy travel.